Home / NHL / Rangers Persevere…Advance to Stanley Cup Finals! Last night, New York Rangers Head Coach, Alain Vigneault was about as blunt as humanly possible after being asked what his reaction would be, if in late October he were to get a phone call saying that his team would be in Cup Finals. AV replied with a laugh and followed that by saying, “probably would’ve said what are you smokin’?” The gathered contingent of media members burst out into laughter. That relationship proved to be vital after a tumultuous beginning to his tenure as the incumbent to John Tortorella, a man that had a completely opposite relationship with New York’s rabid media. Early on, Vigneault infamously proclaimed that he had barely watched any film on his new team. This was purposely done so that he and his coaching staff would be able to assess the roster without any “preconceived notions.” He even coined the slogan “Clean Slate – Grab It” during training camp. I myself questioned whether I would be able to stomach watching Vigneault for an entire season behind the bench just chewing his gum, looking clueless as his team crawled out to a 2-6 start and with a roster that just didn’t seem to fit properly. It was understandable as the Rangers were known as a defensive oriented, sacrifice your body at all costs hockey team under the aforementioned, Tortorella. The really troubling sign though for Ranger fans early on was the uncharacteristically poor play of the man known around these parts as “The King.” That didn’t keep the Rangers brass from awarding Lundqvist with a sparkly new 7yr $59.5M deal. You see, since taking over the full time goaltending duties for the Rangers back in 2005, Henrik Lundqvist has amassed somewhat of a cult following and deservedly so. In the franchises 7 seasons before Henrik, New York failed to reach the playoffs in each of them, becoming one of the leagues laughingstocks with their penchant for overpaying veteran free agents that would ultimately underachieve. The King quickly became New York’s stabilizing force and backbone. Lundqvist, a usurper to some, mostly due to the fact that he’s never been able to lead NY to the Stanley Cup Finals, has his opportunity on the games, biggest stage to cement his legacy. Fast forward back to the present time and while many of the faces on this hockey club are the same as the ones that were eliminated in 5 games by the Boston Bruins in last years, semi-finals, this season’s rendition has quite a different ring to it. Maybe the biggest thing that happened to the Rangers this year was the gusty trade before the deadline of its home grown Captain, Ryan Callahan to the Tampa Bay Lightning for fears that they would lose him during free agency over the summer. In return the Blueshirts inherited one of the great hockey players of this generation, Martin St Louis. A Captain in his own right but maybe even more importantly then that, a man who already has his name etched on what may be the most difficult Trophy to win in all of North American sports. It looks as if all things are aligning perfectly for the Rangers as they have one final hill to climb. If AV can continue to roll 4 lines deep and St Louis keeps on playing like the Champion he is, even if it is with a heavy heart, he’s aware that his new band of brothers of less than 3 months have his back. 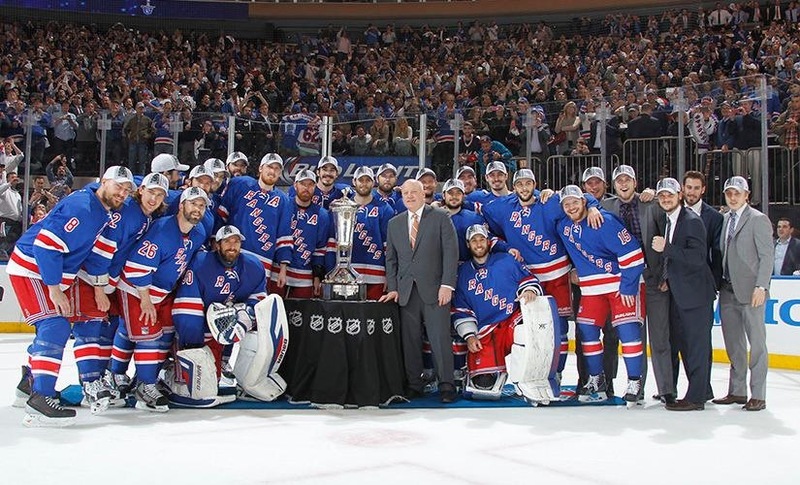 Last but most certainly not least if King Henrik plays the way he has for most of his NHL career, the New York Rangers very well may once again hoist Lord Stanley’s Cup, ironically 20 years after Mark Messier & Co. did the honors.